Stephan Lamb Associates uses two shops. Our "home base" is located in Lowell MA, with another workshop in Nashua NH. Our “shop” is located in Lowell Massachusetts at 171 Lincoln Street. Our Lowell shop has over five thousand square feet of space. 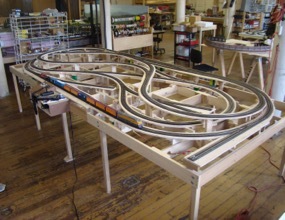 The shop has a large, spacious area to build multiple layouts with a fully equipped custom paint room, electronic bench and modeling facilities. We also partner with Asler Wood and it is a fully equipped woodworking shop in Nashua NH, where our custom cabinetry is built. 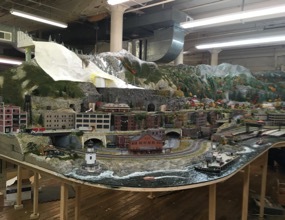 All railroads are built in the Massachusetts shops, no project is too big or too small. We take time to build it right and we stand behind our work. We have a very fast turnaround time for completion in our shop is normally from 2-7 months depending on the size of the project, or unless the client decides to schedule a longer period of time or extends the project. Once completed in the shop, then we pack and ship the railroad to your location. The work that we do in a few short months, saves years of time for our clients. Some of our clients would like us to build or work on the railroad at their location. If you need work done at your home or business, we have a crew ready to travel anywhere in the continental United States. 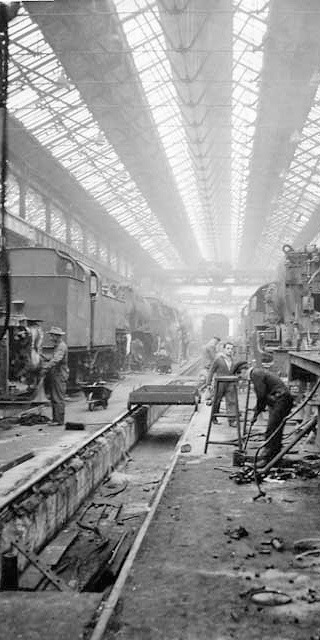 Building on location of the railroad would take a lot more time to build and is subject to our work schedules and is not as cost effective compared to us building it in the shop, because of limited work time and travel expenses.